Webhost.pro was founded in 2001 as a company that would offer “a stable web hosting service with personal support and transparency”. Now it has been in the industry for years and has grown into a reputable business known in the USA. They do have years of experience in the industry and are attentive to their reputation. Shared hosting is not the only thing they offer, and they seem to get pretty favorable feedback from their customers on the Internet in general (which might be not the most representative factor; however, there are hostings that receive mostly negative reviews). There is no chance at the moment to trace the way their website looked since its creation, but the present design is very nice and user-friendly. They are cool here, too. Webhost.pro can be characterized as a provider that offers budget hosting. There are 4 shared plans on offer, also several payment options (1, 3, 6, and 12 months). There is a 45-days money back guarantee, you can try and test it for yourself. Support options offered: phone and fax numbers, contact form. Ticket system is also here. 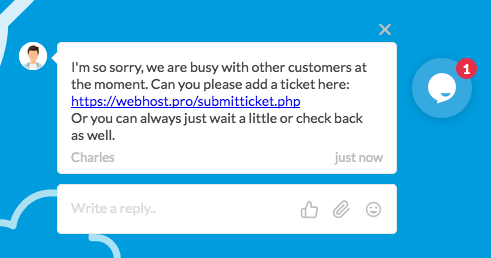 However, we’ve had no opportunity to test their live chat as the only response we got was that they were busy with another customer. We would be glad to recommend them, however, they only got 3.4 HRank and became #182 in 2018. Their general performance was mostly stable in the monitoring period; though, not exactly smooth. In accordance with our uptime chart, they did their best trying to keep their promise recently, yet, they failed several times and one of them was a ~91$ downtime case. The provider’s response time got worse and slower by the end of the year. The average range was 600-800ms in 2018. “We limit the number of accounts on each server to about three hundred websites at a time. Our competitors (like the ones you see on TV) host thousands of websites per server.” That’s the statement with the meaning they are better, and it is a fair one. As of our data, they had 7, and then 6 Shared IPs and 500-400 websites in 2018. So, they keep their word here. However, there was a decreasing trend in the number of websites. Either it is an attempt to stay smaller, or users left unsatisfied, we can’t say.